News | Engaging Spaces with Technology Integrated Furniture | Spectrum Industries | Total Video Products Inc. The TechCenter is Spectrum’s all-in-one teaching station that has everything you need all in one space. The TechCenter’s double unit has the ability to support up to two 70” displays and with its optional rack cube, you can easily manage your AV technology. 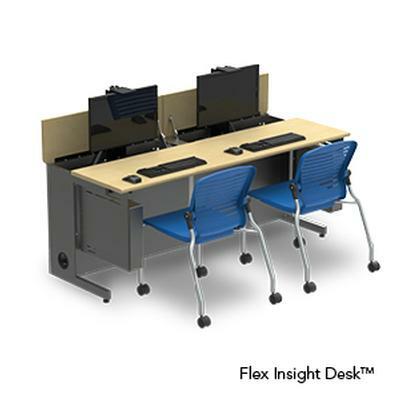 In addition, the TechCenter’s optional pull-out shelfs, dry-erase boards, and AV Technology management system can engage students in any space due to its technology integrated features.